Nowadays, being a certified professional is a norm rather than an added advantage. IT setups not only look for premium education qualification but are also on the hunt for certified individuals who demonstrate a certain level of expertise in their job profile. 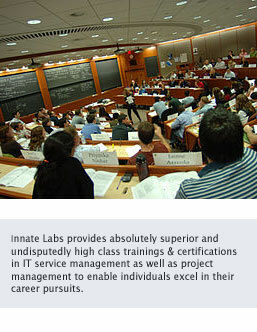 In order to facilitate quicker access to certification programs and allow individuals to study and gain the requisite knowledge at their own pace, innatelabs provides set of preparatory certification programs leading to international certifications. In the software testing certification preparatoy series, innatelabs provides ISTQB foundation certification preparatory program. The ISTQB foundation certification program by innatelabs, covers the foundation level qualification laid down by ISTQB Board. The ISTQB is responsible for the international qualification scheme called “ISTQB Certified Tester”. The program equips individuals with knowledge in testing domain enabling them to excel in their testing career. It also prepares individuals to appear for the ISTQB foundation examination. The ISTQB foundation certification program is aimed at people involved in software testing field. This include people in roles such as tester, test analysts, test engineers, test consultants, test managers, user acceptance testers and software developers who would like to appear for the ISQTB foundation level examination. The course also includes several quizes and mock online examinations helping individuals gain confidence and expertise on the topics as part of the ISTQB foundation certification examination.